This article contains the stats, strategy, and guide for Archer - Eurayle. We will update this as soon as the game comes out. Euryale is the sister of Medusa and Stheno. She is a gorgon, just like her two sisters. Just like them, Euryale is also capable of turning men into stone. Fate Grand Order Euryale’s main strength lies in her increased damage and advantage over male characters. Her skill Siren Song has a chance to inflict the Charm status on a male target. Her Noble Phantasm is her most powerful attack on a single male target, as it inflicts a number of debuffs in addition to a 900% increase in damage. For the overcharged version, it will also inflict Charm for 1 turn. This makes her very useful for defeating Servants such as Gawain encountered during the Main Quest. Orion is another Servant who can usually deal more damage than Euryale against male targets. Despite this, Euryale’s Charm-inflicting attacks allow you to stall enemies for 2 or 3 turns, in addition to being easier to get during summoning. 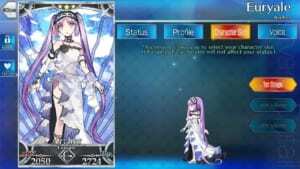 Among the best teammates for Euryale are Stheno, Medusa (Lancer) or Orion who also shares some abilities that are good to use against male enemies. This essentially allows you to form a man-killer team. Euryale also works well with Jeanne D’ Arc to prevent her from taking too much damage. The most popular CEs to give to Euryale is Formal Craft or Divine Banquet. These allow her to quickly fill-up her NP gauge. Arts Buff CEs are also very good options for increased NP damage. One way to also protect Euryale is to go with Shroud of Magdalene. This would lessen the incoming damage from Male Servants, making her truly a Male-Killer. Players can also opt to use Projection as it can boost her Arts cards. Increases own damage by 300. Increases own resistance to debuffs by 30%. Chance to reduce one enemy’s NP gauge by 1. Siren Song A 1 9 Chance to charm one Male enemy for 1 turn. Whim of Goddess A 3 7 Increases own arts card performance for 3 turns. Deals 900% damage to one enemy. Deals extra damage against Male enemies. Reduces their attack by 20% for 3 turns. If the enemy is Male, charms him for 1 turn. Euryale is the middle sister among the three Gorgon Sisters. She has Stheno (the eldest) and Medusa (the youngest). Because of her beauty, many people worshiped Euryale to the point it angered some of the goddesses. Unlike her younger sister Medusa however, Euryale and Stheno were considered immortal. Born to the same parents, the girls all had some chthonic and demonic power within them. This, in addition to the curse of Athena against she and her sisters, turned her hair into venomous snakes. Similar Medusa, she had the ability to turn men into stone should they look into her eyes. However, she is more known for her bloodcurdling cries. In the game, Euryale appears to have a more sadistic demeanour than her two sisters.